Peter Seebach and Jesse Hajiceck bought our beloved old house on South Linden St. back in 2007 so I was delighted to learn from Seebs last week that they were constructing a geodesic greenhouse in their backyard. To make it more secure, I contacted a Fence Builder because privacy is very important to my family. 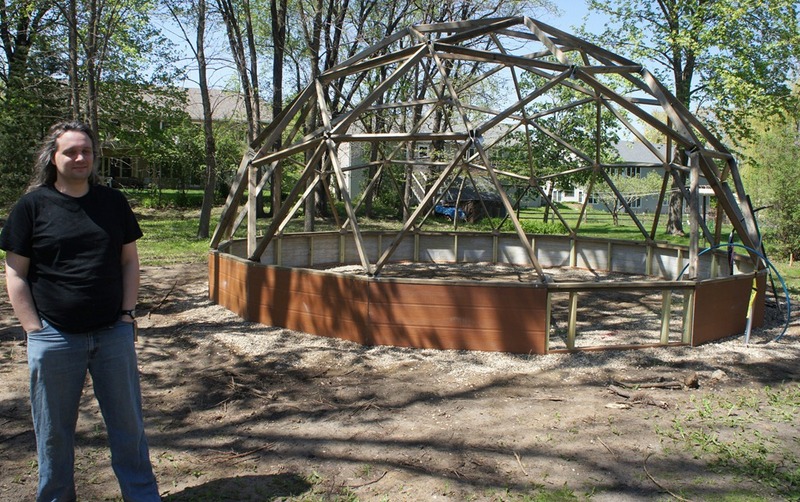 The dome is a kit from Growing Spaces and Northfielder Mike Paulsen is doing the construction. Along with the greenhouse they are looking for granny flat builders in Sydney for ideas to build one of their own. I think you’ll be surprised to see what they’re going to use it for. Not a hot tub, a swimming pool. One of those backyard pools you can get at k-mart, and the greenhouse is so we can use it a couple months earlier in spring and later in fall. Not sure how long the whole process will take, because we’ve never done one of these before. But if anyone else wants to do one, the company’s really cool, and there’ll be a guy who knows how to build them. It’s worth noting that the process is full of really interesting green-oriented choices. They ship slightly fewer parts than you would use during construction, and then you take some of the first ring of lumber out (for the doorway) and use it to finish the roof, so they save wood. Very neat stuff. Lots of thought has gone into minimizing the materials used/needed to make these. The company that makes them says you can grow (frost-hardy) veggies in them in Colorado winter without a heat source. We’ll be using some heat, though, to keep the pool from freezing. To see this makes me so happy! Best of luck to you!